First I wanted to say I love your blog. This is the only place I could find with a detailed ACCURATE vault suit tutorial from scratch. I love my cosplays to be as accurate as possible and this is very helpful. The pictures are amazing. 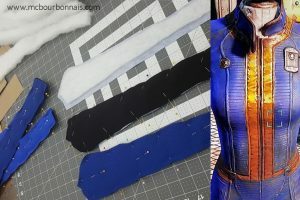 I do have a question, as I’ve also been working on patterning my own vault suit (I’m a bit chunky so I need to make bigger curves in the pattern pieces. It’s quite the chore). 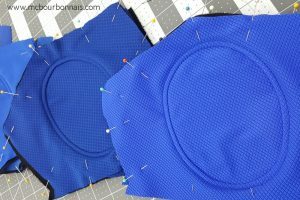 Why did you choose quilting for the bits by the trim? I had come to the conclusion that it was reverse pleating. Or just scraps sewn together to save fabric or something. It seemed like a seam (😂) to me. Thanks for your comment about my blog! I’m so happy to know it could help you in your sewing process. 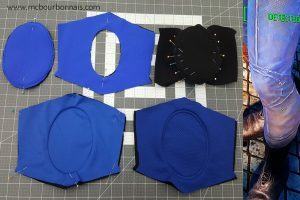 :D One of the most important part of cosplay that many people seem to forget is all the work that needs to be done before we even start the patterning and sewing: analysing. When I choose a cosplay, I print tons of reference pics from every angle to see all the costume’s details. Unless you’re reproducing a costume from a movie, you’re usually working with illustrations or 3D models. All these costumes have in common the fact that they were designed by people who don’t know how to sew. Comic book artists, manga artists, video games’ concept artists, they all reproduce clothes as they see them in real life with their eyes of people who don’t know how a garment is actually made. When I first looked at the Vault suit, I asked myself what the concept artist could have seen on a garment that he decided to include as a design element in the Vault suit. I tried to guess what the concept artist could have been thinking of, what his inspiration could have been. Analsing the Vault suit in the game, I thought it was likely that this design was reproducing a quilting effect and that quilting in real life would be a realistic, credible adaptation of the suit in the game. Plus, I thought that quilted parts would match the retro futuristic overall look of what is supposed to be kind of a high tech suit in the game. Pleating was a good idea too, it’s a question of personal interpretation. We would have the real answer only if we could talk to the concept artist who designed this. But we’ll never know… That’s what makes each of our cosplay costume unique. We all make our own version of a costume. :) Good luck with your project! Is this the final post? I’ve never made a full body suit before, and I have a question about interfacing with stretch fabrics. 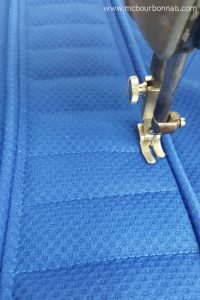 I understand that interfacing is important for supporting fabric, especially when you’re doing something like quilting. However, doesn’t the support of the interfacing take away from the stretch of the fabric? Do you have to account for less stretching in interfaced areas by making the other yokes wider? Thanks again! This is all very helpful. Thanks for your kind words about my blog. :) If it can help someone learning, I’m very happy! 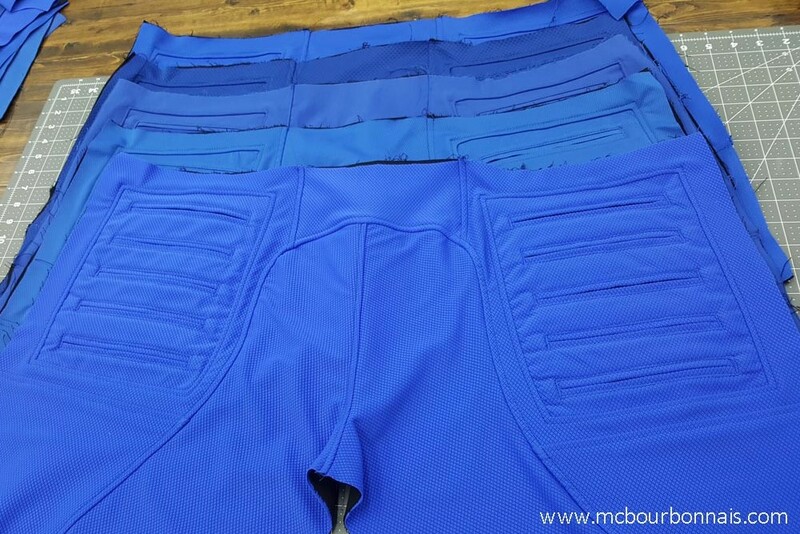 There’s actually stretch and non stretch interfacing. 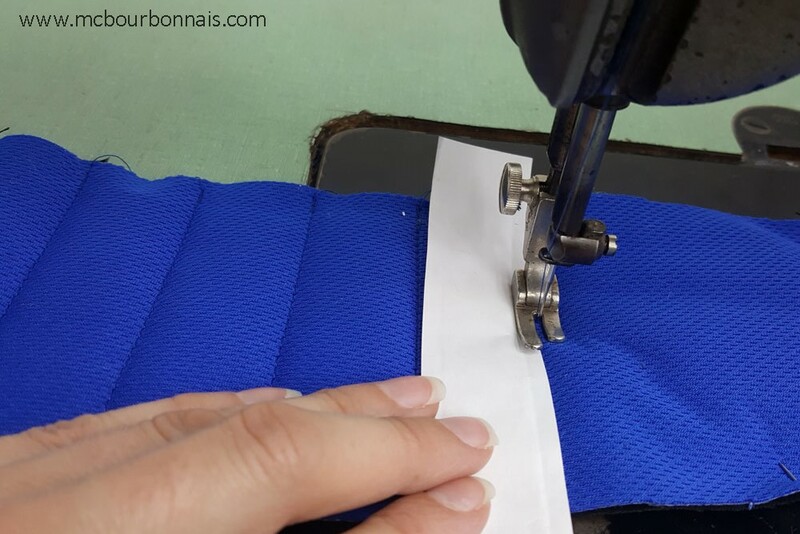 We’ll use non stretch, woven interfacing in a shirt or jacket’s collar, wrists or in the front where the buttons and buttonholes are, to reinforce the fabric. 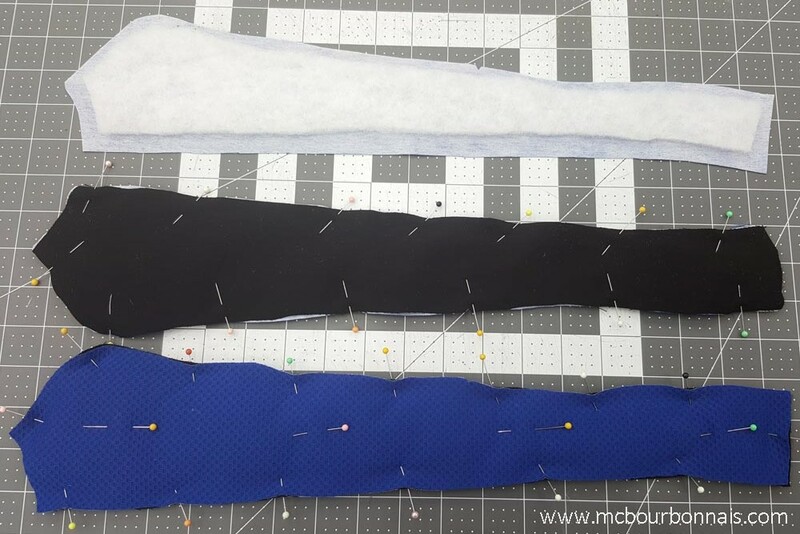 If it’s a stretch fabric, we might want in some situation to use a non stretch interfacing for this exact reason, to keep these specific pieces of the garment from stretching. 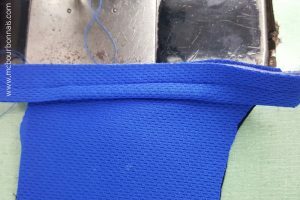 However, sometimes, we need a stretch fabric to keep its extensibility and we’ll use stretch, knitted interfacing that will support the fabric without keeping it from stretching. It’s good only for little pieces though, you couldn’t use fusible stretch interfacing on a large piece that will stretch a lot and expect that the interfacing won’t come off, unless it would be an industrial fusible interfacing applied with a lot of heat and pressure, which our little iron won’t do. 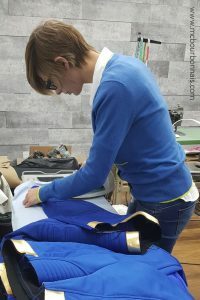 For my Vault suits, I litterally lined each piece with another stretch fabric, so the whole suit has a lot of structure, but is still stretch. 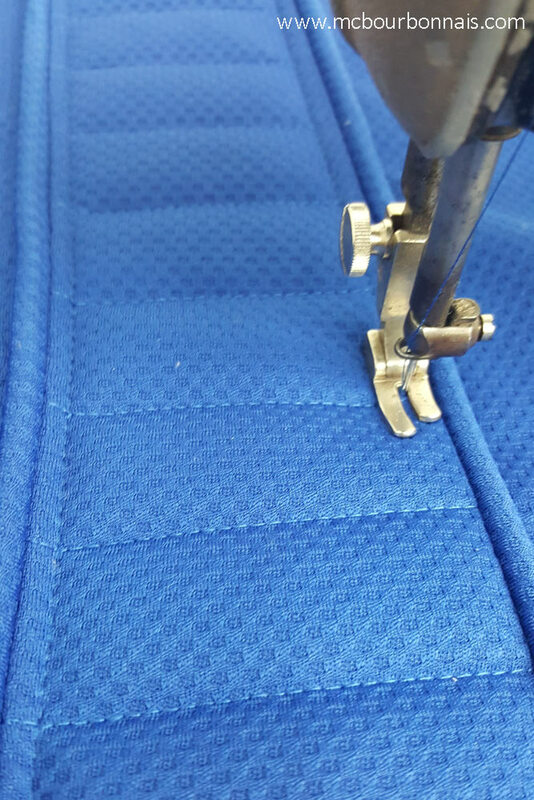 Some pieces, like the piece where the welted pockets are, have non stretch interfacing so make the sewing of such a detail possible. It means that this specific rectangle on the sides doesn’t stretch anymore, but the rest around it still does. Hope it helps! :D Thanks for taking the time to read my blogs! Thank you so much for the help! 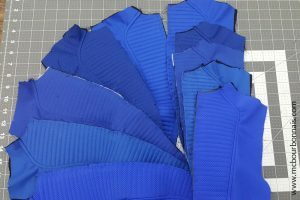 Thanks to your blog and response, my test vault suit is going well and I have lovely quilted pieces that fit correctly! They feel so sturdy and retro future! If I could bother you with one more question, I found black textured fabric for making my test suit, but for the life of me, there’s no textured BLUE stretch fabrics that look quite like what I need/want. So many of the different textured fabrics you found are good options, and I was wondering if you would be okay with telling me what stores you visited to get the fabrics. My hope is that I could find your stores online and try to buy from them. (The online vendors I’ve found don’t have quite what I want, and I only have one fabric shop in my area! It kills me! lol.) If you can’t provide store names, that’s okay, but I figured it doesn’t hurt to ask! Thanks again! You’re a real inspiration, and I can’t wait to see the whole suit reveal!! 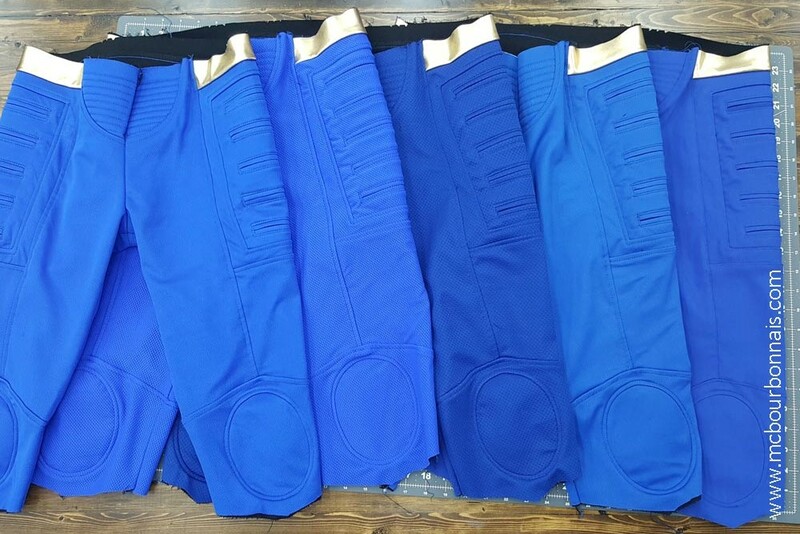 Happy to know that your Vault suit project is going well! 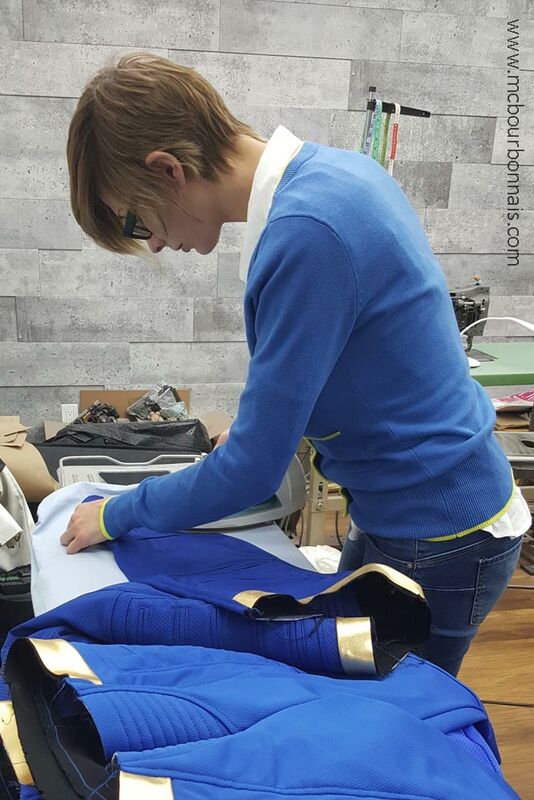 :D All the fabrics I used for my Vault suits were bought in local stores through the province of Québec, I didn’t order anything online. I remember I had found 1 or 2 fabrics at Tonytex in Montréal, but that was a really long time ago. I counldn’t tell if this specific fabric is still available. I had probably found another of these fabrics at my local Club Tissu in Québec City, not sure anymore… Even though it’s very hard to find fabrics around and we’re having less and less choice, I rarely order online because we never know what the real color of the fabric will be. 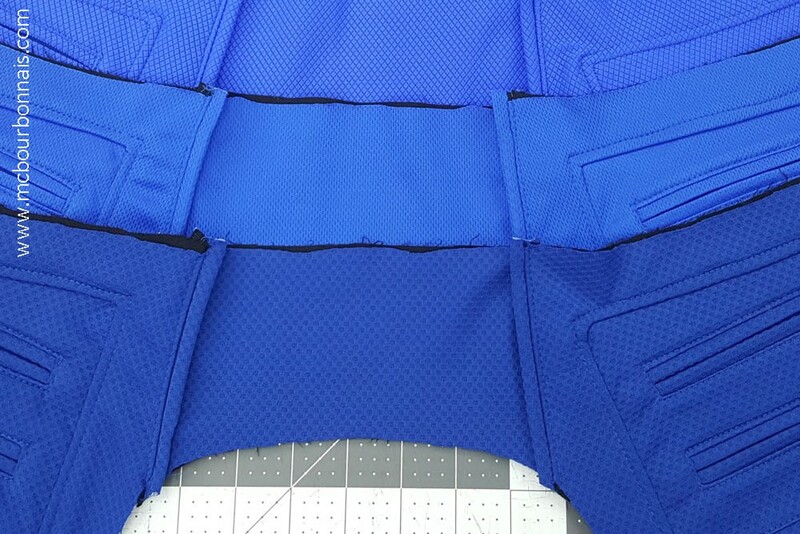 I’ve been flipping through your posts on this suit, but I didn’t see this mentioned – where did the base blue fabric come from? It’s a fantastic match for the texture required, but I haven’t been able to find anything like it online! I found 5 different stretch blue fabrics in various fabric stores in my area. 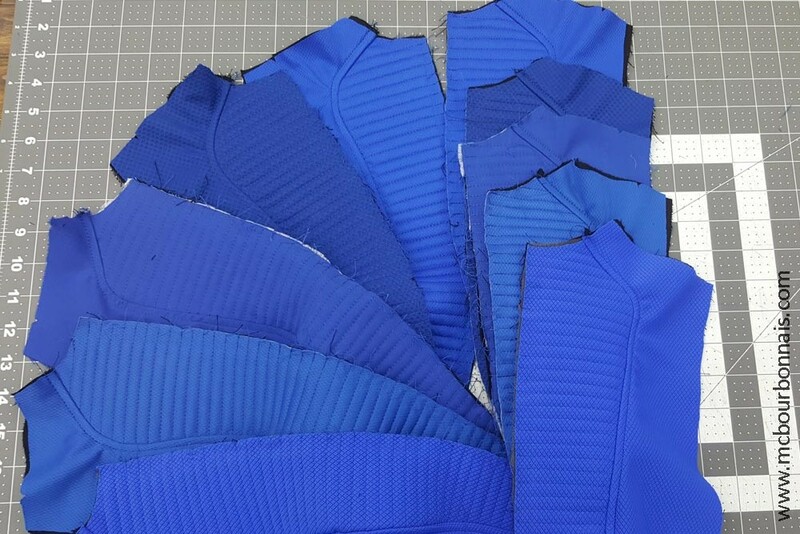 Actually, each time I would find a blue stretch fabric that could work for a Vault suit, I bought it. I had finally found 5 different fabrics and it’s a friend of mine who said: ‘Why don’t you do 5 Vault suits, one in each of your fabrics, one for each Vault in the game.’ And that’s what I decided to do. :) One of the fabrics is a woven polyester with some elastane in it. Plain blue, no texture. It’s finally the one that I like the least. The 4 others are knits, mixes of polyester and elastane too, some are more stretch than others and they have different textures. The most stretch looks like a fabric that could be used for a swimsuit or for leggings. 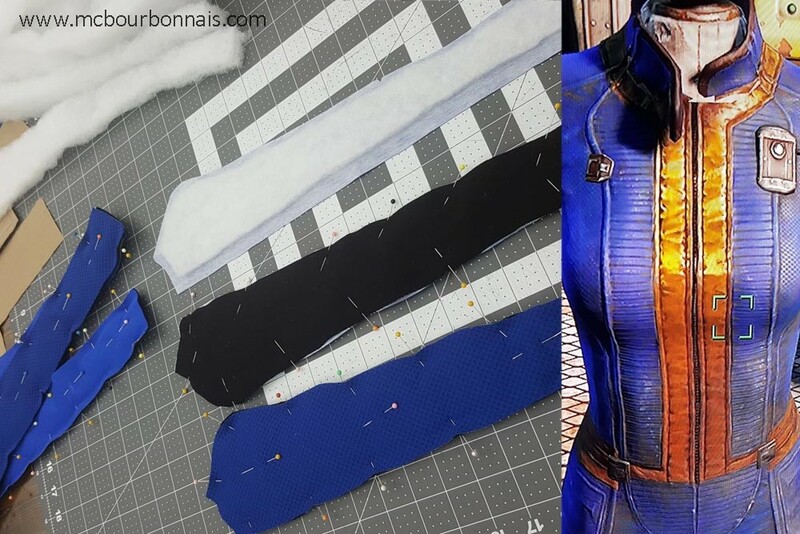 To do a suit that is as fit as it is in the Fallout 4 game, I absolutely needed a stretch fabric. Great skills really and I love the attention to detail in these costumes. So looking forward to seeing the new non-cosplay (really?) costume…..
I’m so sure when Vault suits was designed for game, there was some inspiration in old anti-g suits used by air force pilots. That padding and piping look same. You did hell of a work so far, keep it going!